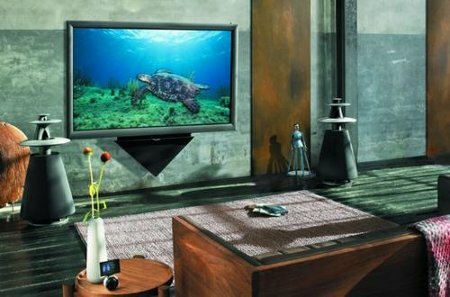 Bang & Olufsen joins the 3D TV revolution with their latest release, the BeoVision 4 that sports 85″ of viewing goodness. Yes, you read that right – a whopping 85″ for your eyes to crawl all over the place, drinking in all the detail that you would care to. Touted to be revolutionary as it delivers what some might claim to be the best picture experience of any plasma screen on the market, you can expect your eyes to enjoy Full HD images, razor sharp details, rich-lifelike colors and smooth movement of objects. Not only that, the BeoVision 4 will also ship with a patented Bang & Olufsen Automatic Color Management technology that is capable of countering the effects of age, making sure it will deliver exceptional picture quality at a high level of performance year after year. Features of the BeoVision 4 include a dedicated center loudspeaker known as the BeoLab 10, where it will rely on the patented Bang & Olufsen Acoustic Lens Technology, that is capable of dispersing sound at a 180 degree angle throughout the whole area. This would mean your ears are subjected to an unmatched sound experience which will accompany the high quality picture performance. BeoLab 10 will spread the sound equally and horizontally from the center channel, where this will enable viewers to receive all the nuances from the film dialogue, never mind where they are seated in the room at that time. Not noly that, this 85″ member of the BeoVision 4 family will also come with a special stand that elevates the display at the touch of a button. Whenever the TV is turned on, the display will elevate itself to the correct viewing position (that depends on where you set it, of course), followed by the seamlessly integrated BeoLab 10 center loudspeaker. No idea on pricing, but we do know that the BeoVision 4 will arrive as a screen-only solution at a lower price point, while a 103″ version is also up for purchase later this summer at a yet undisclosed price. That means you still have time to save up, no?